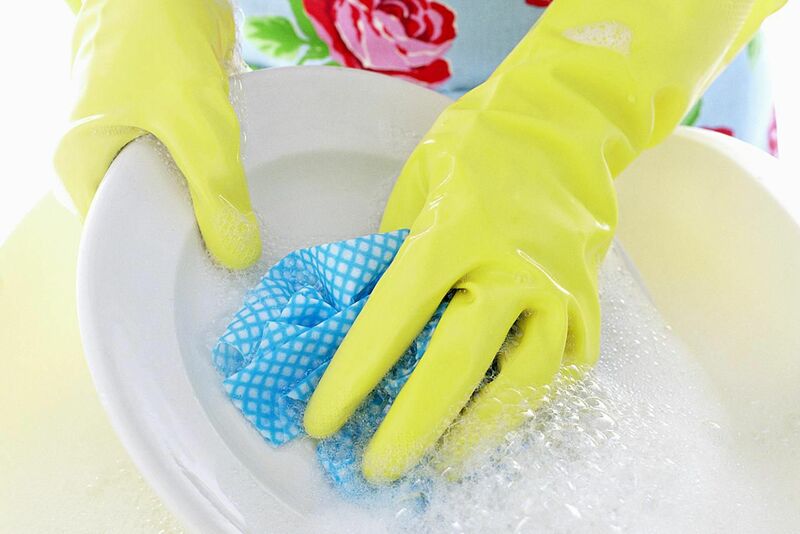 Rubber dishwashing gloves come in handy when we want to protect our hands from household chemicals, staining, hot water, or icky substances that need to be cleaned. There are many types of rubber dishwashing gloves available for household needs, but the best ones will be durable while still allowing you to accomplish tasks effectively. We tested several types with different claims of effectiveness and comfort; these five are the gloves worth using around your home. Vileda's Fresh Comfort Gloves include slip resistant fingertips to help with gripping. This is a huge help when you are holding a slippery plate in a sink full of sudsy water. They are lined with foam instead of the traditional cotton lining which will help absorb more moisture and keep your hands from feeling like they are in a sauna even in the warmest water. The long cuffs on the gloves are very lengthy, making it easy to fold them over and prevent water from running back down your arms. This is a wonderful feature when you are working with surfaces or cleaners that you really do not want anywhere near your skin. Mr. Clean Loving Hands gloves have an extra long cuff to prevent water from running into the gloves, and the palms have extra grippers to help prevent slipping. We especially liked this feature when working with glass pans and other dishes that have a tendency to slip and slide as you are trying to scrub them. The gloves are lined with cotton, making it easy to slip them on and off. This is a nice feature if you aren't a fan of foam liners. Mr. Clean's Loving Hands gloves come in sizes small, medium, and large so you'll be able to find a pair that goes on and off easily and still gives you control over the finer details of cleaning. RiteAid's cuff gloves are very long, allowing flexibility to fold over the cuff or not, depending on your cleaning needs. In fact, given the length on these, you may not even need to fold the cuff over. If you have long arms, this pair of gloves that can offer real protection. These latex gloves are strong and durable although not as sweat resistance as other brands. They are, however, very inexpensive yet still strong. The palms are slip resistant, making dishwashing easier and safer in slippery soapy water. The gloves come in sizes small, medium and large so you can find the perfect fit for your chores. Playtex Living gloves are cotton lined for comfort and fit. The gloves include reinforced fingertips and palms to help with slippery dishes. Playtex Living gloves also include long cuffs to help catch drips that find their way down the arms during cleaning. The gloves are available in small, medium and large sizes. Vileda's Sensitive Plus gloves are thinner to allow the most feel and comfort while completing household jobs. The reinforced fingertips provide antislip protection for delicate items. The Sensitive Plus gloves are not lined, but they do come in a variety of colors and multiple sizes. Vileda's Sensitive Plus Gloves are great when you need to be able to have more control over your fingers. They're great for cleaning glassware because the entire hand and finger surface is textured to prevent slipping.